Have spent the last couple of days crunching to get some orders done by today. I was going to post pics tonight, however had planned to do the following post before this, and as this will be brief and it is getting late will do this one now. I wanted to show the basic tools I use. I have a huge assortment of "proper" supplies/tools, however seem to stick with only several that I use consistently. *Baby wipes, clay, stylus, knitting needle, scalpel, and my all-time favorite sculpting tool.....a vintage nail/cuticle pusher. When I started sculpting I did not have any tools and found that this particular item worked great for me. Several years ago, I thought I had lost it, went and purchased four newer ones and I just could not use them. They didn't have the same heft or feel and I could not get used to them. Fortunately, I found my 'favorite tool'! I honestly am lost without this little metal item. If you are reading this and new to sculpting, don't wait until you have the 'proper' tools. Try items you may have around the house. The above are what works for me, however many artists use other common household items (toothpicks, crochet hooks, etc). You never know what may work, unless you experiment. Will post some WIP and pics of what I just finished, tomorrow. Is Prosculpt what you use for the majority of your works? Is it air dry? It's so much fun to see the tools and "bones" behind an artist's work. I find crochet hooks to be wonderful tools with many uses beyond crochet! heheh - I know exactly what you mean. I can't make a vise work - I still need to stack books on something LOL. 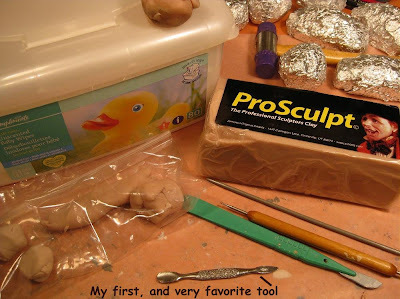 I think that Pro-sculpt is a polymer clay like Sculpey that must be baked. I remember scouting around the house looking for modeling tools after the wooden craft tools I found at Michael's were too cumbersome and clunky. Not very strong, either. Thank you for sharing, I'm new to sculpting with clay, love that LaDoll paper clay, and I have found just stuff around the studio to use too! 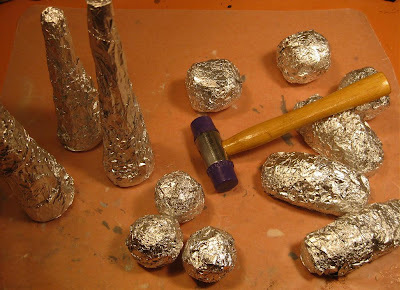 I've never used foil or wire, that is only for baked clay? My favoutite tool is a lace pin with a round metal ball head. Its tiny and I spend a lot of time on the floor looking for it LOL but its my favourite , also love my knitting needles, I sculpt my heads on the end of a 2mm knitting needle as in miniature it gives the perfect size hole for the wire !